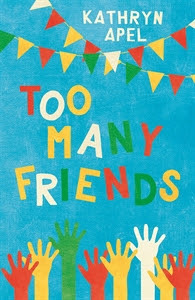 Kathryn Apel, author of Bully on the Bus and On Track, has produced another stunning read with her third verse novel, Too Many Friends. She has mastered the art of word selection and uses dialogue sparsely to successfully sculpt images and capture emotions. Her writing is brief and precise, going to the heart of things and of people. This time it is schoolyard friendships and bullying, connected to difficulties faced when trying to please all of your friends all of the time. Its multi-layered themes also encompass encouraging children to reuse and recycle old objects to create new ones; looking past what is bought to experience the joy and satisfaction of making something creative on your own. Everyone wants to be Tahnee’s friend. She’s a delight to be with; gentle and understanding, and the best friend all her friends have ever had. But what happens when your friends don’t get along with each other? How do you please them all without disappointing someone? Brilliant approaches to handling differences in people are delivered with insight, so are clever solutions to problems we all face, regardless of age. Addressed are conflicting emotions in children, being new and out of place due to economic situations, and coping with others that are difficult to be around. Tahnee the narrator’s voice is warm and personal. It reaches out to children (and people of all ages) about the need to give and take. It subtly suggests lateral thinking and alternate use of language in all areas of everyday life, particularly within relationships.